Narrative Description The Whitefish Point Lighthouse is a seventy-five foot, cylindrical iron light tower supported by an iron skeleton framework attached to the adjacent two-story, rectangular-plan, front-gabled, frame keeper's dwelling by a covered walkway. A side-gabled structure is attached to the keeper's dwelling by a hyphen. Brackets decorate the eaves and six-over-six double hung sash pierce all walls. The dwelling rests on a brick foundation. Next to the tower is a one-story brick building constructed to house the boilers for steam-powered fog horns. Statement of Significance Whitefish Point and later, its lighthouse, have been critically important for traders from Native Americans to U.S. shippers, and the first recorded use of the parabolic reflector system of illumination in Michigan. A stone dwelling and wooden light tower were constructed on this site in 1848 to aid navigation of the dangerous and narrow channels of the Upper St. Mary's River. This was found to be inadequate and the structure was replaced in 1870 with the present building. In 1902 additional living quarters were built for an assistant lightkeeper. In 1944 the interior of the dwelling was remodeled so that the building could accommodate an additional family, thus the building became a three-family residence. 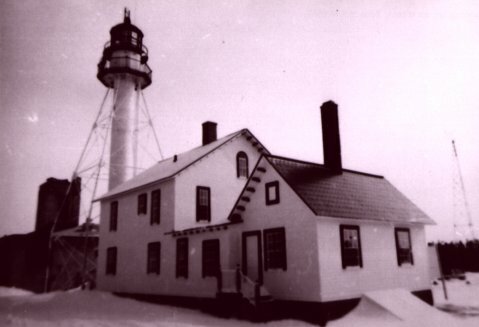 In 1962 when an automatic light was installed nearby, the Iroquois Point light was no longer needed. The property was transferred to the U.S. Forest Service. Since then, the light tower, visitors center and museum have been open for sightseers. Currently the building complex is under license to the Great Lakes Shipwreck Historical Society. Marker Text WHITEFISH POINT LIGHTHOUSE This light, the oldest active on Lake Superior, began operating in 1849, though the present tower was constructed later. Early a stopping place for Indians, voyageurs, and Jesuit missionaries, the point marks a course change for ore boats and other ships navigating this treacherous coastline to and from St. Mary's Canal. Since 1971 the light, fog signal, and radio beacon have been automated and controlled from Sault Ste. Marie.